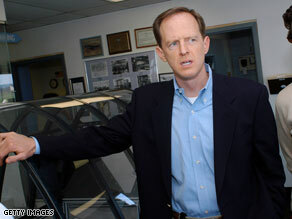 Pennsylvania Senate candidate Pat Toomey is one of a number of politicians who received a campaign contribution from Massey Energy CEO Don Blankenship. Washington (CNN) - Executives of the company that owns a West Virginia coal mine that claimed 25 lives on Monday have long been involved in donating to state and national political leaders. People associated with Massey Energy, along with its political action committee, donated more than $307,000 to federal candidates since the 1990 election cycle, according to an analysis from the nonpartisan Center for Responsive Politics. The center found that 91% of that money went to Republicans. In addition, the company's CEO, Don Blankenship, has personally donated more than $60,000 since 2000 - all of it to GOP candidates and causes. "Don Blankenship ... is a particularly active political bankroller," a report from the center finds. In the last two years, according to its information, Blankenship has given $30,400 to the National Republican Senatorial Committee; $2,300 to Sen. James Inhofe, R-Oklahoma; $2,300 to former Virginia Governor Jim Gilmore, who was exploring in 2008 presidential bid; and $2,000 to Pennsylvania senatorial Candidate Pat Toomey. The company's PAC has not been particularly active in the last couple of election cycles. The center did find that 16 current members of Congress - 12 Republicans and 4 Democrats - received some money from employees of Massey Energy or its PAC. Much of the money given by the committee in previous elections has gone to candidates for state office, including those running for the state legislature. According to disclosure reports, Massey Energy has done some federal lobbying, although the center found that it did not spend the maximum allowed between 2005 and 2009. It lobbied for a tax change, among other issues. The political activity for which the company and Blankenship are best known involved his spending of $3 million in 2004 to support a campaign by Brent Benjamin running for the West Virginia Supreme Court of Appeals. Massey Energy had been involved in a business dispute with a rival mining company, and a jury in 2002 awarded the other company, Harman Mining, $50 million. Massey Energy, which was alleged to have helped force the other company out of business, waited for four years to appeal. Blankenship defended his political donations, saying that "without a change in the (state) Supreme Court, businesses will continue to avoid West Virginia." In 2006 Justice Benjamin, the beneficiary of Blankenship's donations, refused to recuse himself from Massey's appeal and then voted to overturn the jury's verdict. The case made its way to the U.S. Supreme Court, which ruled last year that Justice Benjamin should have recused himself. - CNN Supreme Court Producer William Mears contributed to this story. There needs to be an investigation. This company had 400+ violations in 2009. That's the Pat toomey, our former Congressman, that we know and loathe. Mr. Corporation. Lobbying+G.O.P.= less safety for workers which leads to more work related deaths at the coal mines but more profits for Massey Energy. welcome to America. Now we see the price we pay for all that DEREGULATION of industry. The lives of 25 people! 91%??? I'd be LMFAO if it wasn't so disgusting. It was asked on CNN this morning of wone of their guests, who was talking about the regulatory requirements these companies consistently shirk, whether those requirements are "cost prohibitive." That is the language of cost-benefit analysis. Let me explain: the cost of not obeying the regulations is small mining towns facing several dead parents and loved ones. Please. Explain to me which side of the equation is truly "cost prohibitive." If we want results from these companies...just like with any other issue where giant corporations are abusing their workers and ignoring the regulations (think Wall Street), we have to start putting them out of business for disobedience. Period. You want to talk pay to play? Time for them to start paying up instead of paying off. So the Republicans that he sends money to ($307,000) have not made him make this mine a much safer place to work. These deaths should be on all of these Republicans' conscience. But the Republicans are nice, convervative people. Shame on them! These lives could have been spared. "you know, if it wasn't for them unions forcing these companies to pay their workers fairly, they could afford better safety measures and regulatory compliance...duuuuuuuuuh, pass the Early Times maw...."
Do Republicans support the worker, or the owner? Should families of the miners be allowed compensation for their loss? Should we enact TORT reform to limit that compensation? It's so sad... that accidents like this have to happen before the questions like these can be properly illustrated. And is there any wonder why Massey has been allowed to get away with all the safety violations with fines that don't even amount to a slap on the wrist? What the bureau of mines and OSHA should do is multiply the fine by every employee at a worksite. That way if there are 300 workers at a site and a violation carries a $10,000 fine, it should be multiplied by the three-hundred workers, resulting in a $3,000,000 penalty for that violation! I bet that would make them fix the problems and make the mines safer! This is also a classic reason why corporations should not be allowed to set up PACs to illegally fund elections. Oh, wait! The Supreme court said they can fund them directly now! I bet Blankenship is gonna have to buy a boatload of elections to get out of this mess! , a mine owner who donates to the GOP is not suprising! Of course he would NOT donate to any party who regulates his business or pushes to develop alternative energy sources. It would be nice if he donated money to ensure the SAFETY of his miners first!